SCV Camp 458 Meeting Tonight, July 23rd! This entry was posted in Uncategorized on July 23, 2015 by scvpacnw. The Sons of Confederate Veterans has lost a brave and articulate friend and America has lost an independent voice for racial reconciliation and understanding. Anthony Hervey of Oxford, Mississippi was a warrior for his beliefs and those beliefs were rooted in a passionate and unequivocal understanding that he was a proud Son of the South. His death, on Sunday, July 19th, appears to be because of the way he lived his life. Mr. Hervey and a companion, Arlene Barnum of Enid, Oklahoma were returning from a Confederate Flag celebration in Birmingham, Alabama when his car was forced off the road near Oxford by a carload of men who apparently were chasing him down. The Ford Explorer he was driving skidded and then rolled over several times, killing Hervey and injuring Ms. Barnum. 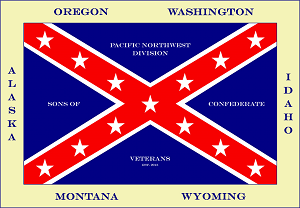 support of Confederate Heritage appears to have played a part in this incident. We ask that every member pray for justice, understanding, and especially for the family of Mr. Hervey as they endure his passing. We also asked prayers for the brave Arlene Barnum as she heals from the attack. Both she and Mr. Hervey had family members who fought for the Confederacy. Members also are encouraged to donate to http://gofundme.com/hervey to help offset funeral expenses. We will never forget this brave warrior who fought for the healing of the South and helped to build a bridge to brotherhood. For he was indeed our brother. suspicious death of Mississippi political activist Anthony Hervey. Hervey, 49, of Oxford, Mississippi was killed when the automobile he was driving was forced off of Highway 47 north of Oxford on Sunday morning, July 19th. A passenger who survived the crash reported that their car had been forced off the road by a pursuing car. Arlene Barnum told authorities that she and Hervey were returning from a Confederate Flag rally in Alabama when the incident occurred. According to Barnum, a silver car with several African/American males chased their Ford Explorer and forced it off the road, where it flipped several times. Both Hervey and Ms. Barnum are also African/Americans. Commander Barrow praised Hervey’s independent thinking and his courage in supporting Confederate Heritage. Helena Montana Confederate Memorial Fountain under attack! I am requesting that any SCV members, Friends of the SCV, or people who would like to join with us, get involved and rally around this monument. We cannot lose this battle. Send all emails to imbel308win@yahoo.com. in Hill Park was constructed by the Daughters of the Confederacy in 1916. City leaders are considering whether it should be renamed. The future of a 98-year-old granite fountain built as a memorial to the Confederate soldiers who died in war may take shape Wednesday when Helena city commissioners meet. The commission’s 4 p.m. administrative meeting on the third floor of the City-County Building comes in the wake of a commission discussion in late June about the fountain’s place in the community and a subsequent proposal by Commissioner Andres Haladay where he sought commission support to ask the City-County Parks Board to rededicate it. This Confederate memorial in Hill Park was placed there in September 1916, the same year the park was created. It has been under the microscope since last month’s slaying of nine people at Emanuel African Methodist Episcopal Church in Charleston, South Carolina. Dylann Roof, who was photographed with the Confederate flag, was indicted Tuesday by a grand jury, online news sources say, on nine counts of murder and three counts of attempted murder. In a bid to defuse some of the opposition to the proposal to rename the fountain, Commissioner Katherine Haque-Hausrath responded to correspondence from Pam Attardo, the Helena/Lewis and Clark County historic preservation officer, to say the proposal by her and Haladay never including removing the fountain’s inscription or touching the fountain. “I know that constituents and visitors to Helena have expressed concern to me about Helena having a Confederate memorial,” Haque-Hausrath wrote on July 7. “We think our proposal will maintain the historical integrity of the fountain, honor all of the Civil War dead, while not having the government support a publicly owned Confederate symbol. As is being discussed across the country, we do not believe an explicitly Confederate memorial and its attendant support for slavery and more recent symbol for white supremacy and exclusion of minorities, is appropriate for our city,” her letter stated. Haladay on Tuesday also wrote to the commission to suggest the fountain be rededicated as a Civil War Veterans Fountain and that city staff create language for plaques to address both the historical aspects and the commission’s decision to rededicate the monument to all veterans who chose to call Montana their home after the Civil War. 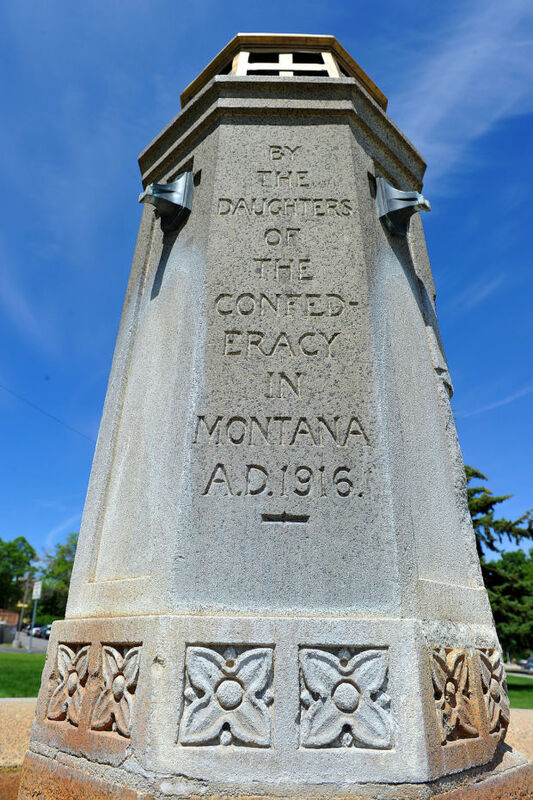 The historical aspects of the fountain that Haladay proposed to address are both the reconciliation and relations between the former enemies during the Civil War who came to Montana and the United Daughters of the Confederacy’s motivations for the monument. Helena Mayor Jim Smith wrote the city commission to say he will be unable to attend the administrative meeting and that he would prefer that the elected city commission rather than a volunteer advisory board handle any renaming of the fountain. He suggested in his July 6 letter that a commission resolution be prepared with an accompanying public hearing for the process. The mayor said he also didn’t support renaming the fountain nor, as some have suggested, razing it, he added. All traces of the Romanov dynasty and the czars were removed after the Russian Revolution, Smith stated. The same thing happened in China during the Cultural Revolution, he continued, and that this is happening today in the Middle East and Central Asia where all traces of Buddhist and Hindu cultures are being destroyed. He also noted that Helena’s Jefferson Elementary School, as well as Jackson Street and the Helena streets named after George Washington, are all named after prominent slave owners. 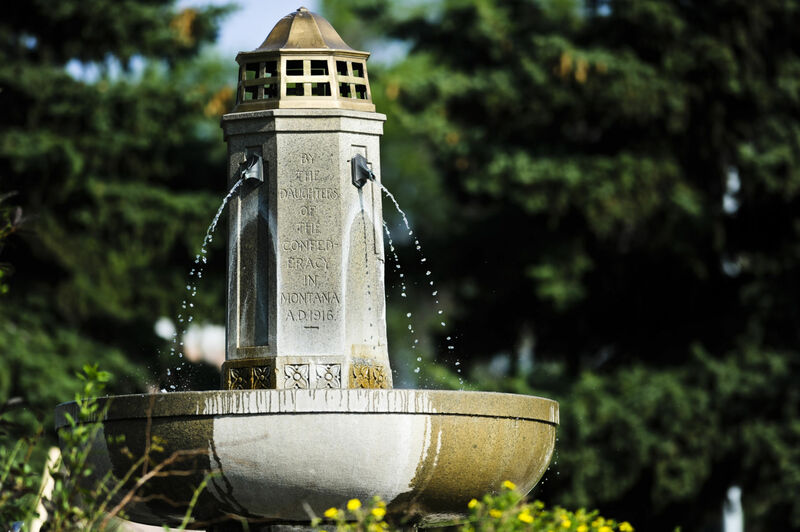 “Once this begins — with a fountain in Hill Park — where will it lead and where will it end?” the mayor asked in his letter that instead called for a community conversation about racism in America, Montana or Helena. While Columbus Day, a federal holiday, will be observed Oct. 12, a suggestion has been made to proclaim it All People’s Day or Indigenous People’s Day in Helena and plan events around that, much like what is done for Martin Luther King Day each January, the mayor stated in his letter. “I’ve been meaning to ask my fellow city commissioners about this idea for a while now,” Smith added. This entry was posted in Uncategorized on July 21, 2015 by scvpacnw. ~ Doris Kearns-Goodwin, Team of Rivals: The Political Genius of Abraham Lincoln, p. 207. ~ Abraham Lincoln, First Lincoln-Douglas Debate, Ottawa, Illinois, Sept. 18, 1858, in The Collected Works of Abraham Lincoln vol.3, pp. 145-146. Steven Spielberg’s new movie, Lincoln, is said to be based on several chapters of the book Team of Rivals by Doris Kearns-Goodwin, who was a consultant to Spielberg. The main theme of the movie is how clever, manipulative, conniving, scheming, lying, and underhanded Lincoln supposedly was in using his “political skills” to get the Thirteenth Amendment that legally ended slavery through the U.S. House of Representatives in the last months of his life. This entire story is what Lerone Bennett, Jr. the longtime executive editor of Ebony magazine and author of Forced into Glory: Abraham Lincoln’s White Dream, calls a “pleasant fiction.” It never happened. Moreover, there is not a shred of evidence that even one Democratic member of Congress changed his vote on the Thirteenth Amendment (which had previously been defeated) because of Lincoln’s actions. Donald documents that Lincoln was told that some New Jersey Democrats could possibly be persuaded to vote for the amendment “if he could persuade [Senator] Charles Sumner to drop a bill to regulate the Camden & Amboy [New Jersey] Railroad, but he declined to intervene” (emphasis added). “One New Jersey Democrat,” writes David Donald, “well known as a lobbyist for the Camden & Amboy, who had voted against the amendment in July, did abstain in the final vote, but it cannot be proved that Lincoln influenced his change” (emphasis added). Thus, according to the foremost authority on Lincoln, there is no evidence at all that Lincoln influenced even a single vote in the U.S. House of Representatives, in complete contradiction of the writings of the confessed plagiarist Doris Kearns-Goodwin and Steven Spielberg’s movie (See my review of Goodwin’s book, entitled “A Plagiarist’s Contribution to Lincoln Idolatry”). There is no evidence that Lincoln provided any significant assistance in the passage of the Thirteenth Amendment in the House of Representatives in 1865, but there is evidence of his effectiveness in getting an earlier Thirteenth Amendment through the House and the Senate in 1861. This proposed amendment was known as the “Corwin Amendment,” named after Ohio Republican Congressman Thomas Corwin. It had passed both the Republican-controlled House and the Republican-dominated U.S. Senate on March 2, 1861, two days before Lincoln’s inauguration, and was sent to the states for ratification by Lincoln himself. “I understand a proposed amendment to the Constitution — which amendment, however, I have not seen — has passed Congress to the effect that the Federal Government shall never interfere with the domestic institutions of the States, including that of persons held to service . . . . [H]olding such a provision to now be implied constitutional law, I have no objection to its being made express and irrevocable” (emphasis added). Believing that slavery was already constitutional, Lincoln had “no objection” to enshrining it explicitly in the text of the U.S. Constitution on the day that he took office. He then sent a letter to the governor of each state transmitting the approved amendment for what he hoped would be ratification and noting that his predecessor, President James Buchanan, had also endorsed it. Lincoln played a much larger role in getting this first Thirteenth Amendment through Congress than merely endorsing it in his first inaugural address and in his letter to the governors. Even Doris Kearns-Goodwin knows this! On page 296 of Team of Rivals she explained how it was Lincoln who, after being elected but before the inauguration, instructed New York Senator William Seward, who would become his secretary of state, to get the amendment through the U.S. Senate. He also instructed Seward to get a federal law passed that would repeal the personal liberty laws in some of the Northern states that were used by those states to nullify the federal Fugitive Slave Act, which Lincoln strongly supported. (The Fugitive Slave Act forced Northerners to hunt down runaway slaves and return them to their owners). So, go and see Spielberg’s Lincoln movie if you must, but keep in mind that it is just another left-wing Hollywood fantasy. Thomas J. DiLorenzo [send him mail] is professor of economics at Loyola College in Maryland and the author of The Real Lincoln; Lincoln Unmasked: What You’re Not Supposed To Know about Dishonest Abe, How Capitalism Saved America, and Hamilton’s Curse: How Jefferson’s Archenemy Betrayed the American Revolution — And What It Means for America Today. His latest book is Organized Crime: The Unvarnished Truth About Government. This entry was posted in Uncategorized on July 20, 2015 by scvpacnw. A passenger in Hervey’s car, Arlene Barnum, tells The Associated Press that Hervey swerved and crashed after another vehicle carrying four or five young black men pulled up alongside them, yelling and looking angry. Barnum said Hervey yelled something back at the other vehicle before losing control and crashing. “It spun like crazy and we flipped, flipped, flipped. It was awful,” she said. The Mississippi Highway Patrol did not immediately respond to an Associated Press query asking if officials are investigating Barnum’s account. Mississippi Highway Patrol spokesman Johnny Poulos said Monday in a written statement that no other details of the accident will be available until accident reconstruction experts have had a chance to take a look at the evidence. Barnum said she and Hervey had been returning home Sunday from Birmingham, Alabama, where they attended a Saturday rally to save the Linn Park Confederate Monument. City leaders there recently voted to remove the memorial from the park. Hervey, of Oxford, has drawn attention over the years for opposing efforts to change the flag. He said he dressed in Rebel soldier garb to honor blacks who served with the Confederacy during the Civil War. He was often seen often wearing the Confederate uniform and waving a Rebel flag on the Oxford square. “This is not racism. This is my heritage,” Hervey said. WE ARE IN A WAR TO SAVE AMERICAN CULTURE! Visit http://www.scvheritagedefense.org/ Donate to the cause and join the Friends of the SCV Today, its free!